We’re excited to welcome four fantastic acts to SummerFest! They’re stepping out of their Big Yellow Boot and on to the SummerFest stage! 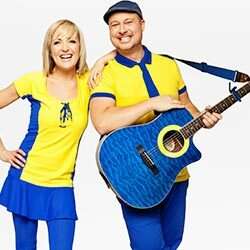 Children’s entertainers Splash’N Boots will have your kids singing, dancing and laughing along with their high-energy performance. Combining powerful storytelling and incredible dance, the White Pine Dancers will make your face, spirit and heart smile. 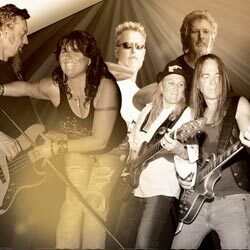 Hard rocking Brave & Crazy brings all your favourite rock and alternative hits to Summerfest. 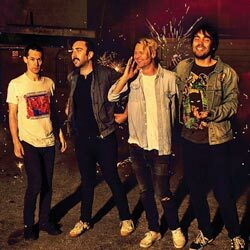 Hear Hollerado in concert once, and you’ll be a fan for life. These eclectic, energetic and super-talented indie-rockers light up the stage with your perfect summer soundtrack. Join us for a day full of summer fun! Our activity tents offer something for everyone. Ice Cream Chill Out – Beat the heat with samples of delicious U of G vanilla ice cream developed by U of G food scientists. Feeling adventurous? Try the stout-flavour in a waffle cone! Planter Picks – Get creative and design your ideal planter box with flowers from U of G greenhouses. Take home a plant from U of G’s trial garden and plant breeding programs as a thank you gift. Gryph-Zone – Get active with Gryph! Try unique summer sports like Quidditch, giant Omnikin ball, Nerf battles and Gaga dodgeball. Score big in our inflatable soccer field. Picnic Party Games – Hop to it! Challenge your friends to a potato sack race or a game of badminton. Try out a colourful new look with face-painting and hair chalk! Swing your Partner – Get into the swing of things with square dancing lessons! Slimy Science – Add some science to your summer by exploring non-Newtonian fluids. Say what? Sometimes they're liquid, sometimes they're solid. Find out why! Take the fun home with a do-it-yourself slime kit. White Pine Experience - Create a clan necklace using traditional materials and learn about the Indigenous teachings behind this craft. Artscade – Show off your pinball wizardry skills with retro arcade games! Stretch your artistic skills with Gryphon colouring sheets. Going Global – Chat with U of G English Language Students from around the world and learn about holidays and festivals from their home countries. Try your hand at origami and see what your name looks like in another language. Stuffie Wellness Check – Learn what happens when your pet goes to the vet. Student vets will perform a wellness check on your stuffie. Calling all future vets! Bring along your favourite stuffed animal. Cross-Canada Summer Road Trip – Take the ultimate summer road trip without leaving Johnston Green! Have your photo snapped at Canadian landmarks and share it with your friends. Gryphon Football Fun – Meet the Gryphon football team, navigate our obstacle course and catch some air in the bouncy castle. You could even win free tickets to a game! Some of the best food trucks in Ontario will be rolling up to Johnston Green to feed the SummerFest crowds! Berlin 95 – Schnitzel, sausage, sliders…and baked potatoes! SummerFest guests 19+ are welcome in our beer garden. P23 and P24 (2 accessible spots) – Off College Ave. near Gordon St. 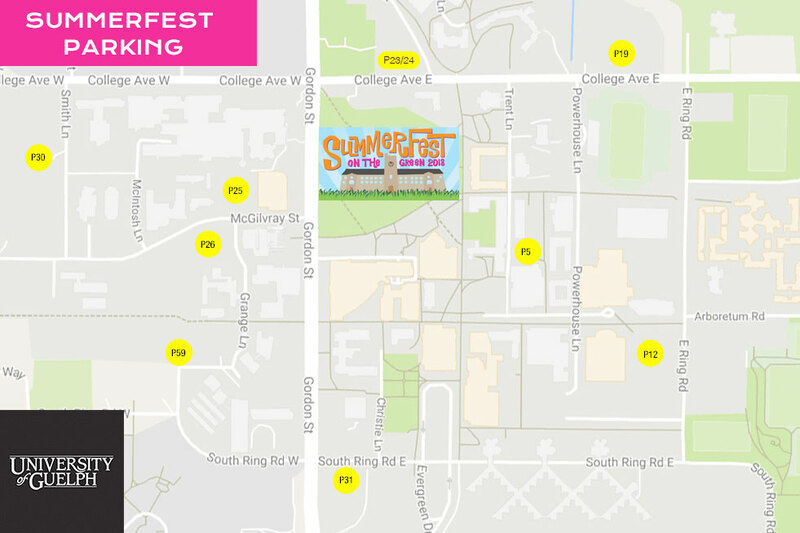 Parking for SummerFest is free! We’re looking forward to a fantastic kick-off to summer with SummerFest on the Green 2018! Check out some of the highlights from last year’s event. Email summerfest@uoguelph.ca for more information. Our volunteer registration is now closed. Please join us as a guest on June 24th!